Geoff Downes Interview: Prog Rock Masters Yes Explore the Black and White World of Dichotomies on "Heaven & Earth"
A native of England, Geoff Downes, along with Trevor Horn, formed the British group the Buggles during which Downes played multiple keyboards to achieve a new wave techno pop sound. In 1979, they released their first album with the hit song “Video Killed the Radio Star,” which was No. 1 on the singles charts in sixteen countries, and the music video was the first to be shown on MTV. Downes and Horn joined Yes (founded in 1968 by Chris Squire and Jon Anderson) in 1980, but the band split the next year, so he joined forces with guitarist Steve Howe (from Yes), bassist/vocalist John Wetton (from King Crimson) and drummer Carl Palmer (from Emerson, Lake & Palmer) to form the group Asia. In addition to recording and touring with Asia, Downes has also recorded a number of solo albums and collaborated with many other artists. While currently active with Asia, Downes has also finished three albums with John Wetton and reunited with Bruce Woolley and Trevor Horn in 2010 as the band the Buggles performing “The Lost Gig” to raise funds for the Royal Hospital for Neuro-disability. In 2011, he participated in the recording of the new Yes album Fly From Here and rejoined the band as a full-time keyboard player. In the spring of 2013, Downes toured North America with Yes and spent March and April 2014 touring Canada with the band. The new Yes album, Heaven & Earth, is released July 22, 2014 in the US. This is the third Yes album to feature Downes since his first appearance with them on Drama (1980). Melissa Parker (Smashing Interviews Magazine): Geoff, are you on tour? Geoff Downes: We’re rehearsing for the tour at this moment and start our first shows on Saturday (July 5). Melissa Parker (Smashing Interviews Magazine): You are such a busy guy performing in both Yes and Asia. What’s the schedule like for you trying to go back and forth between the two bands? Geoff Downes: It’s pretty intense. Fortunately I’ve got some very understanding people around me who try and make sure that nothing overlaps, so it has been pretty okay, but obviously it does require quite a bit of effort on my part to be constantly doing something relating to one of the two bands. Melissa Parker (Smashing Interviews Magazine): Do you enjoy both bands equally? Geoff Downes: I enjoy them in different ways. Obviously Asia is very much close to me because I’m a major contributor to that band and have been from the beginning, so that’s something very close to my heart. But certainly prior to that, I had appeared in Yes, and that was the one thing that really got me going doing what I’m doing today, so I’m very grateful to have the privilege of working with both bands. Melissa Parker (Smashing Interviews Magazine): This was Jon Davison’s first studio album as a vocalist with Yes, so how did he fit in with the rest of the band as far as collaboration? Geoff Downes: We were very conscious of that and wanted to get Jon immediately involved as much as possible. I think it’s very important for a vocalist to have the belief in the stuff that we’re singing about. In that respect, we were pushing him to come up with stuff. We did a lot of collaborations internally in the band between Jon and various members including myself. Jon has been the vocalist now for over two years, so I think it has helped to solidify what we set out to achieve a few years ago. Melissa Parker (Smashing Interviews Magazine): You and Jon collaborated on the song “Subway Walls.” What was the inspiration? Geoff Downes: Jon came to stay with me in my house in Wales for a week or so, and we started kicking around some ideas. I had this neo-classical kind of piece that was done with various industrial orchestrations. I think that’s what inspired Jon to come up with some lyrics that were kind of urban and maybe not the standard kinds of lyrics or the concept that Yes would normally have. We wrote on this piece and extended it. A lot of people have said it’s one of their favorite tracks on the album. It’s kind of nice that we get those kinds of comments. Melissa Parker (Smashing Interviews Magazine): Yes it is. Before the songwriting began, did the band decide on a particular direction for the new music? Geoff Downes: I think generally speaking that the direction finds itself from the songs. Once you have some of the building blocks in place, then you start to put it together from there, and it takes on its own identity. That’s pretty much what happened in the case of this album. We laid the foundations, and then things started to develop on top of that. I suppose that’s just a very natural way of working in the respect that we weren’t tied by any concepts or anything we thought we should be doing. We just let the thing develop in its own way. Melissa Parker (Smashing Interviews Magazine): Do you think the music is softer than in past Yes albums? Geoff Downes: Yeah. I think there are times when it doesn’t have sort of the early Yes, the aggressive kind of riffs and that sort of thing. Each album is different. That was the way this one worked out. As I say, I don’t think anyone had any pre-conception about what we should be doing. The rules mainly were that we do what we felt like doing. I think probably in context, it is a much softer album, but there are still elements in there that are eccentric and sideways that Yes has always been well known for in records. Melissa Parker (Smashing Interviews Magazine): Does the title (Heaven & Earth) have a particular religious significance? Geoff Downes: No. It’s more of a general statement of two opposites working together. Certainly in some of the songs, you get a kind of push and pull of two extremes, so it has more to do with that. It doesn’t actually have any specific religious undertones. Melissa Parker (Smashing Interviews Magazine): Any truth to the rumor that Jon Anderson might be returning to the band sometime soon? Geoff Downes: I don’t know about that. As far as I know, there are no plans at the moment, but I suppose things can change. There may be something at some point, but right now we have this quite extensive tour planned, and then we go to Australia and New Zealand in the fall. At the moment, I can’t see anything like that would be on the horizon. Melissa Parker (Smashing Interviews Magazine): Is playing music all you wanted to do since as far back as you can remember, Geoff? Geoff Downes: Oh yeah. I was born into it, so it was something I always wanted to do. Whether or not I was going to make a living out of doing that, you never know, so I’ve persevered with it. I was lucky to meet up with some great people along the way, and I’m still doing it today. I can’t imagine having done anything different. Melissa Parker (Smashing Interviews Magazine): Did you ever see the Beatles perform in England in the 60s? Geoff Downes: I didn’t, no. I saw quite a few of the bands perform like the Who or the Stones, but I never got to see the Beatles play, although I’ve seen Paul McCartney a few times. Melissa Parker (Smashing Interviews Magazine): The song “Video Killed the Radio Star” was so successful that it basically got you out of the jingle writing business. Geoff Downes: Both Trevor (Horn) and myself were just looking for any kind of session work we could get hold of and doing jingles was a part of it. There is that sort of concise mentality that you need to apply to jingle writing that also existed on “Video Killed the Radio Star,” which is a three-and-a-quarter minute pop song that incorporates a lot of stuff in a short space of time. I still think that the song is a very deep song. It’s got a far reaching philosophical content, and I’m very proud of the fact that it was actually the first one to ever be played on MTV and started a whole generation of music television. Melissa Parker (Smashing Interviews Magazine): Absolutely something to be proud about! Is it true that it took only an hour to write? Geoff Downes: No. It developed over a period of time. Trevor and Bruce Woolley (the other writer on the song) had the bones of the idea. Then we worked on it in my apartment, did a very rough demo, and then from that point on, Trevor and myself honed it down to only a few sections here and there, pretty much turning it into what it was when it was finally released in 1979. Melissa Parker (Smashing Interviews Magazine): You and Trevor produced the song? Geoff Downes: Trevor had some extremely original ideas when it came to production. He brought a kind of quirky, orchestral, synthesizer element to that equation, and that’s why we were a very good team in the studio. We did a lot of stuff with not only just the Buggles but outside of that. I like to hear experimentation, rather than just go with something that is sort of well balanced and pleasant. That would be my preference. 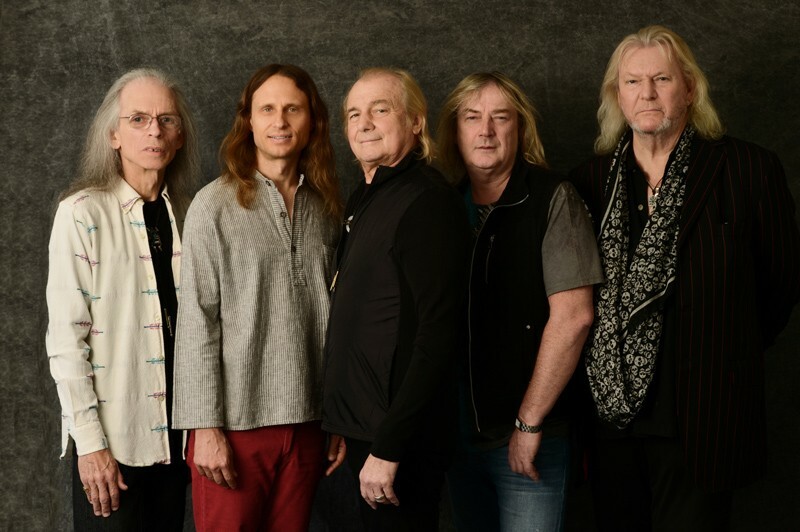 Melissa Parker (Smashing Interviews Magazine): Do you think that Yes will be inducted next year into the Rock and Roll Hall of Fame? Melissa Parker (Smashing Interviews Magazine): I hope so. Are there days, Geoff, that you think about just quitting it all and living on some beautiful resort in the tropics? Geoff Downes: (laughs) Well, it would be nice, but it wouldn’t be so nice. I think that once it’s in your blood, it’s very hard just to walk away from that. I’m very much enjoying it at the moment, so it looks like I’ll be doing this for a while yet. But, you never know.